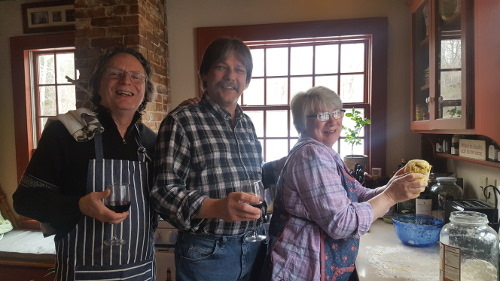 We had our friends Steve and Kathy over for a pasta dinner party Saturday night 03/30/19. We had been talking about doing this for quite awhile. Now, with our news about Chuck coming into our lives to share, Sue set it up. 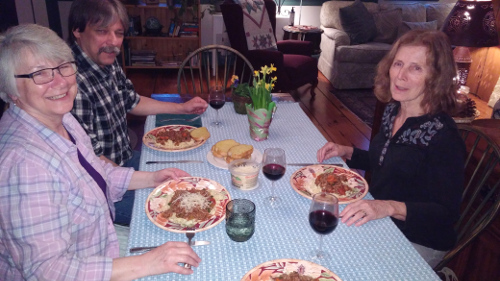 Ready to enjoy our dinner of home made tagliatelle pasta Bolognese. 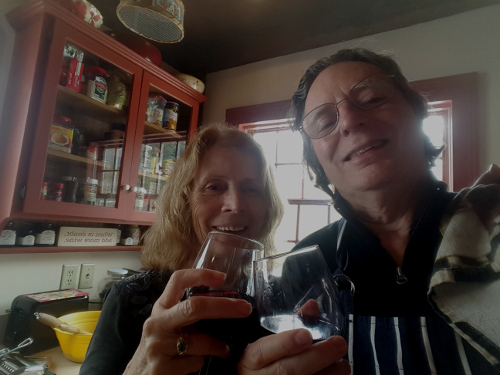 I had bought a bottle of Carlo Rossi Burgundy to use in the Bolognese sauce I was making, as well as for sipping. 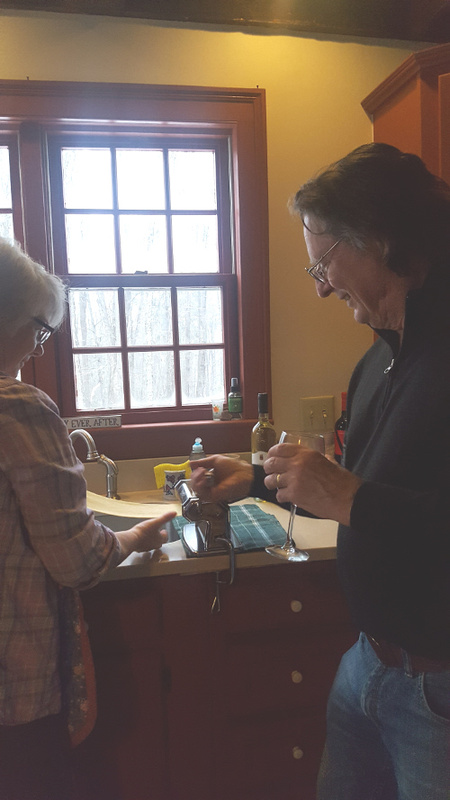 Steve and Kathy brought a couple of nice bottles with them to share, and after a glass of the Rossi, we popped the cork on a wonderful 2015 bottle of Black Stallion Cabernet Sauvignon. That is a nice wine. In fact, it's rated through one wine site as in the top 10 Cabernets under $40. Yup, that was a really nice wine. I had finished all of the vegitable chopping for the Bolognese sauce early that morning. 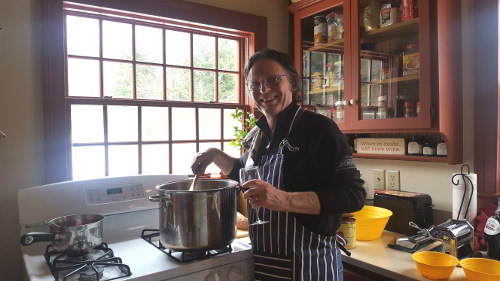 At 2:00 pm I sauteed them in a couple of tablespoons of a nice olive oil, added a pound each of lean beef, and pork, some of the Rossi Burgundy, stock, and some herbs, brought it to a boil, and then just let it simmer until we all sat down for dinner. 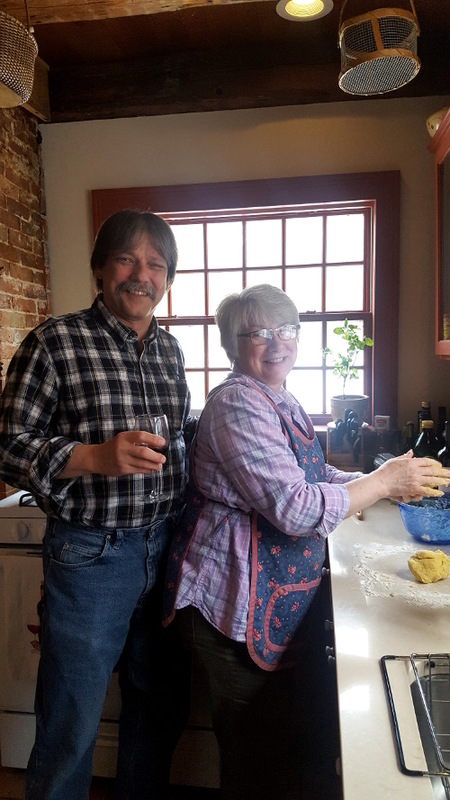 Steve and Kathy came early at 4:15 as we had wanted to spend some time with them catching up before we got all absorbed in making the fresh pasta from scratch. 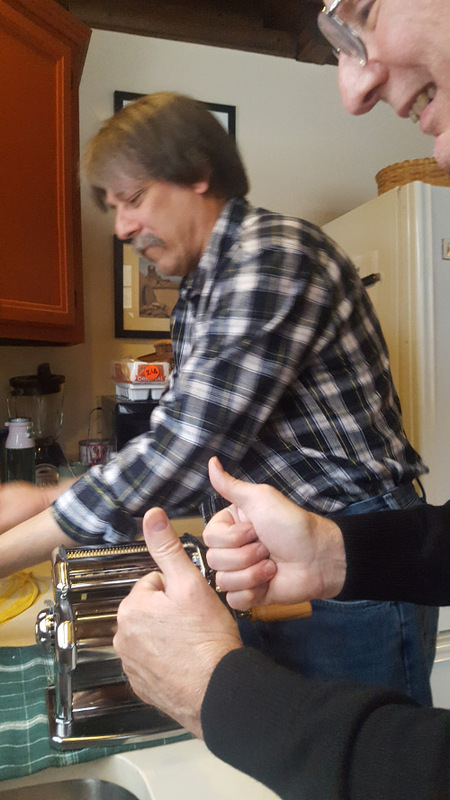 I had planned to eat early, but that didn't work out because I had forgotten that the pasta had to sit for a half hour before we rolled it out for cutting into nice strips of tagliatelle. But that was okay as that spread out the wine drinking and just built the anticipation of the dinner to a more heightened level! It was a great meal as we sat down at the table and toasted to now having Chuck and his family part of our family! By the end of the evening, I was totally stuffed. That could be because I had two big helpings (I couldn't help myself) as well as feasting on Sue's terrific desert, a wonderful Sweet Lemon Ricotta With Mixed Berries. Getting the Bolognese sauce going. And let's get this party started! Kathy starting to get the pasta ready for preparation. Steve and Kathy leading the effort. 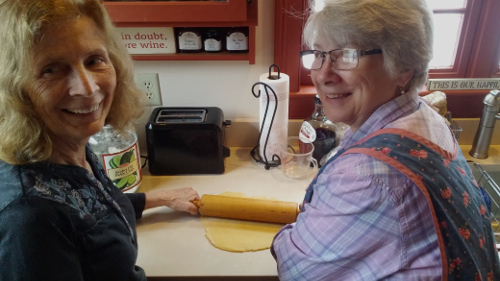 Sue and Kathy rolling out the dough. Kathy catching the rolled dough strip as I crank the handle. Me giving double thumbs up for Steve's efforts.